Moreno Cardenas Inc. are leaders in project delivery and performance. Since 1990 they have consistently delivered a multitude of services to companies and organizations both large and small. Moreno Cardenas is a planning, engineering, and project management firm that knows their clients look to them to serve as extensions of their staff and to help them develop and manage their construction programs and projects. Moreno Cardenas came to Stanton Street to redesign their website because they know that we pride ourselves on developing websites that are unique and designed to reflect the character of our clients. We used a color palette that suited their branding as well as their projects. 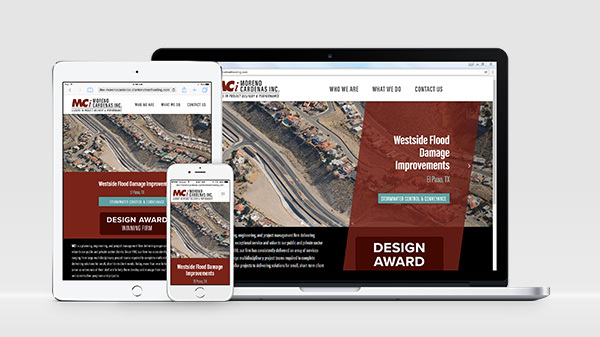 Stanton Street wanted Moreno Cardenas to showcase their work so we gave their homepage the ability to scroll through images and details to feature some of their completed projects. “We took a very direct approach and put the emphasis on their projects, bringing what they’ve done to the center of the site”, explained our Director of Design and Production, Tony Casas. Stanton Street chose to highlight their accomplishments by using call out buttons that lead potential clients toward their accolades and credentials. Potential clients are also able to view areas of expertise quickly so they can assess how Moreno Cardenas will fit into their business. Making their clients current and potential feel comfortable was also very important to us so we wanted to make sure that we highlighted all their certifications. Their new design is streamlined and makes it easy for the user to find what they need quickly. “The design contains tons of cool angles and trapezoid shapes, the challenge here was not using a ton of images to achieve this look. Instead we used CSS pseudo elements to create the perfect angles that look sharp and clean on all screen sizes. These elements along with some subtle transitions really brought the design to life”, explained Sara Acevedo our web developer who took on the challenge. We also put lot of special attention on what the website looks like on tablets and mobile devices to get it working properly across the board. As always, all web development that happens at Stanton Street is responsive meaning that the site will adjust to the size of the screen you are viewing it in. If you’re impressed with the final product that we created for Moreno Cardenas and would like to find out how Stanton Street can fit into your business give us a call at 915.351.8440.